It was one of the South Pacific’s fiercest storms on record. Cyclone Winston, which made a direct hit on the Fijian island of Koro over the weekend, was the first Category 5 cyclone to make landfall on Fijian territory in recorded history. The latest reported numbers indicate that 42 people have died as a result of the storm, with aid agencies warning that more may die in the storm’s aftermath as the small country rushes to reach communities on remote islands. With the storm over, the recovery has begun but the task is monumental. The Fijian government declared a month-long state of emergency and put out calls for assistance. The storm did not make a direct hit on the country’s capital, Suva, but wreaked havoc on Koro and many of the country’s other islands. There are more than 330 Fijian islands, about a third of which are inhabited. Fijian Prime Minister Frank Bainimarama gave a national address Wednesday in which he said, “Almost no part of our nation has been left unscarred.” Per the Sydney Morning Herald, Bainimarama focused attention on immediate concerns: food, water, and shelter.Cyclone Winston flattened homes, caused extensive coastal flooding and knocked out utility and communication systems. The storm also irreparably damaged sugarcane crops. Radio New Zealand reports that New Zealand, Australia, and France have sent relief flights and the United States, China, India, and the EU have all offered financial assistance. The New Zealand Navy is dispatching the HMNZS Canterbury, a multi-role vessel, and the HMNZS Wellington, an offshore patrol vessel, loaded with supplies to assist in recovery efforts. Numerous aid agencies and international organizations have pledged help for Fiji. The Asian Development Bank committed to $2 million in emergency assistance. The Red Cross says it had mobilized more than 300 staff and volunteers in the islands and is releasing emergency funds to the Fiji Red Cross. Days after the storm aid still seems sluggish for some, as Kim Baker Wilson makes clear in a report for Radio New Zealand from Rakiraki, a district on the northern edge of the island of Fiji’s main island of Vitu Levu. An estimated 1,000 homes were destroyed in Rakiraki. And more is needed. Ewan Perrin, the newly-appointed permanent secretary for Communication and Information Technology, said that Fiji would “definitely need more international assistance.” From his comments reported by Radio New Zealand, Perrin said Fiji had “everything that we need at this stage” but that more assistance would be needed in the medium to long term. Fiji’s economy is built on sugar and tourism, both of which are likely to take a massive hit in the storm’s wake. 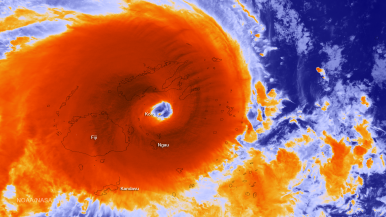 Last year, Cyclone Pam made a direct hit on Vanuatu, devastating the country. In the months after the storm, Vanuatu’s political system nearly imploded with a quarter of the parliament jailed on corruption charges.